Illinois lawmakers over the coming 10 days could cast votes to bring a long-awaited (and much coveted) casino to Chicago, among many other issues, as they begin their lame duck session. For 35 members of the General Assembly whose terms will end Jan. 9, this is a chance to cast controversial votes – like reforming the state’s public pension system – without worry of facing the wrath of voters. Not an especially courageous or efficient way to operate. 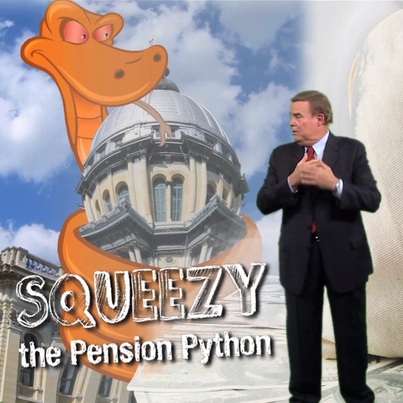 In a mere 24 hours, Illinois has caught a severe case of Squeezy-mania, thanks to the Illinois’ pension predicament’s new mascot, Squeezy the Pension Python. Through no fault of his (her?) own, Squeezy attracted mostly derisive commentary when he/she debuted Sunday. Really, though, the video in which Squeezy appears offers a pretty good explanation the problem. Plus, it opens the exciting possibility of a pension reform bill written in Parseltongue. Indicted, expelled and now reelected former State Rep. Derrick Smith will serve through a full legislative session as he awaits trial on federal bribery charges. His trial for allegedly accepting a $7,000 cash bribe has been set for October 2013. His House colleagues could kick him out again, but they can’t do it a second time on the bribery charges. Yesterday we posted that Gov. Pat Quinn’s office now says the state’s pension liability is $95 billion. One group that has been advocating long and hard for pension reform now says the system can’t be fixed. Civic Committee of the Commercial Club of Chicago has a four-point plan: eliminate all cost of living increases, impose a salary cap at which pensions are calculated, raise the retirement age to 67 and shift all pension costs to local bodies (translation: school districts) over 12 years. The governor’s office has updated its pension numbers over the past week. With the state’s largest retirement system expecting to earn less on its investments, the state’s unfunded pension liability now stands at $95 billion. That’s up from the previous figure of $83 billion. And it will only grow without significant reform to the current pension system. Only a third of Illinois students are proficient in reading after fourth grade. Only a third enter high school academically prepared. More than a quarter of Illinois students who enter high school won’t graduate. Those are among the facts noted in education reform group Advance Illinois’ new study, “The State We’re In,” which says education reform is moving at a glacial pace. Secretary of State Jesse White was the political sponsor of indicted and now reelected former State Rep. Derrick Smith. Now he hopes the House — which kicked Smith out in August because of his pending bribery trial — can figure out a way to expel Smith a second time.